The Outpost at Winter Harbour is located on the rugged, remote and pristine Northwest Coast of Vancouver Island within minutes of some of the best saltwater sports fishing in the world. 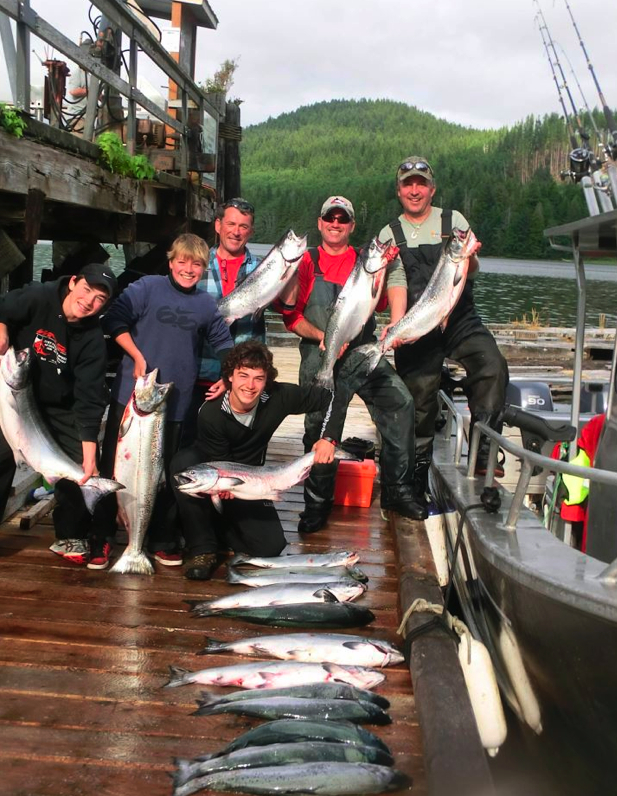 Whether you’re interested in Trophy Chinook (Spring) or Coho Salmon, Halibut, or Lingcod, experienced guides can give you a fishing experience that you’ll never forget. Our waters are so plentiful that on any given day from June thru September it’s not uncommon to catch your limit of all of the above species. The best part is… fish are big here! Not to mention the fact that the scenery and wildlife viewing is really spectacular. We regularly see Grey, and Killer whales, Porpoises, Stellar Sea Lions, Seals, Otters, Black Bear, Deer and much more. Whether you would like to take advantage of our great Accommodation/ Charter packages or bring your Camper/ RV, we look forward to taking you fishing this season and showing your our fabulous backyard. We work with Brooks Bay Charters where a full day guided charter is $1249 per boat (2018 prices). Each boat can comfortably take up to 4 persons and includes all fishing gear and tackle. Guides will clean and pack your fish. Freezer space is also available for charter guests. Two bedroom suite: $230/night for two, and $35/night for additional guests. The suites are fully appointed with two bedrooms (bunks:double bottom, twin top), bathroom, kitchen, living & dining rooms, satellite TV. Studio Suite: $175/night for two. $35/night for additional guest. This suite includes 2 queen size beds, bathroom, kitchen, sitting area with sofa and dining table, satellite TV. Complimentary WiFi is available for lodge guests. Campsite, trailer, and cabin are also available. See ACCOMMODATIONS info here.